North Fork Goodnews Fly-Fishing Trip. 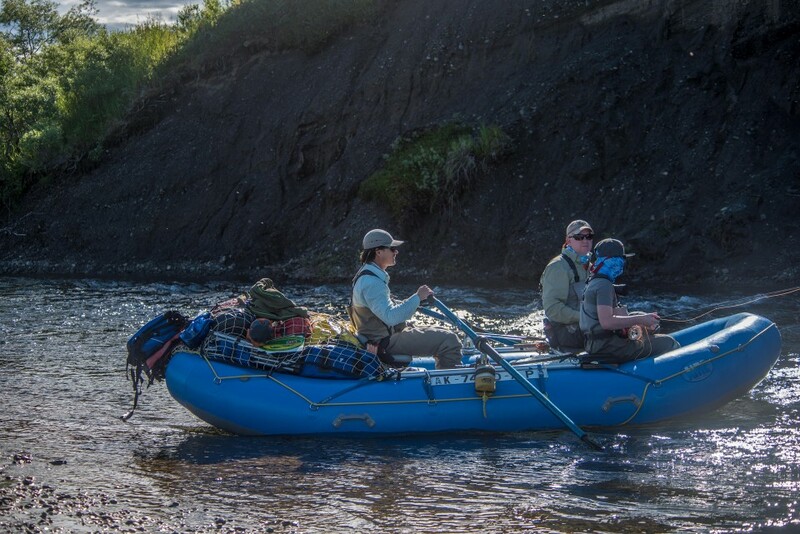 70 miles of Rainbow, Char, Sockeye, Kings, & Wildlife for the Nichols family, Jim Givens, and Nora Jinishian. It rained hard starting about 5:00am and when I peered up at the morning sky I discounted the possibility that we’d be flying out anytime soon. Then the sky began to clear and at 10:00 am the first planeload took off and so our adventure began. Rafts loaded for a week, we headed down the North Fork of the Goodnews fishing our way toward a camp by a lovely bluff on river left. Mary & Danny Nichols and I rafted past hundreds of Sockeye and King Salmon, indicative of a strong spawning season to come. It was the beginning of a week where we saw staggering numbers of fish. 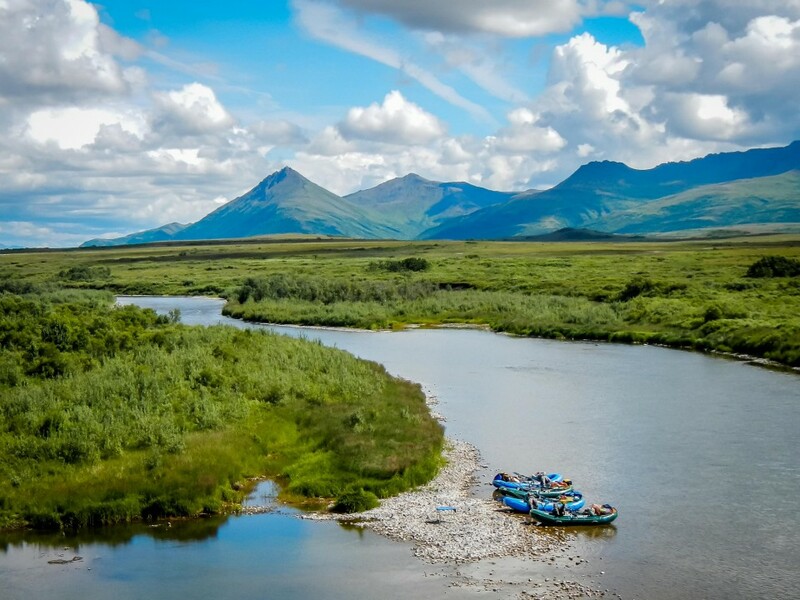 It’s hard to overstate how powerful an experience it is as anglers witness this abundance of Salmon and Trout. 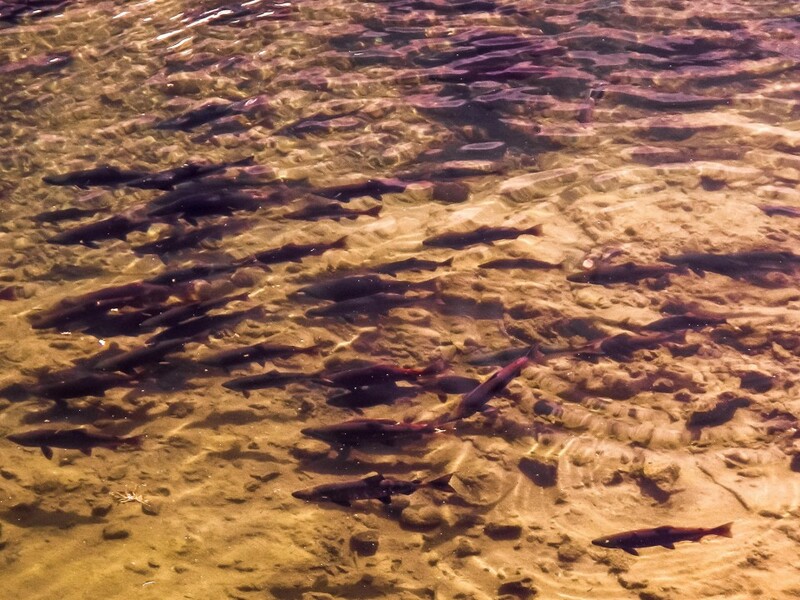 The natural spectacle is what I sometimes call witnessing the “Serengeti of Salmon”. 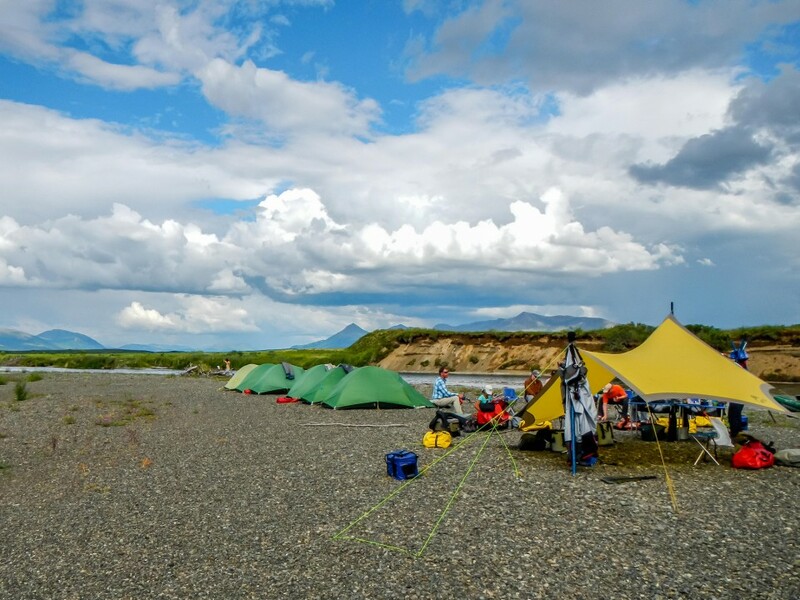 At camp as the pasta dinner was prepared, calls for “Net Man” rang out and all the anglers helped one another netting Rainbows and Dolly Varden. Danny was working on his fly casting and having success. Will was steadily hooked up and there was plenty of excitement. 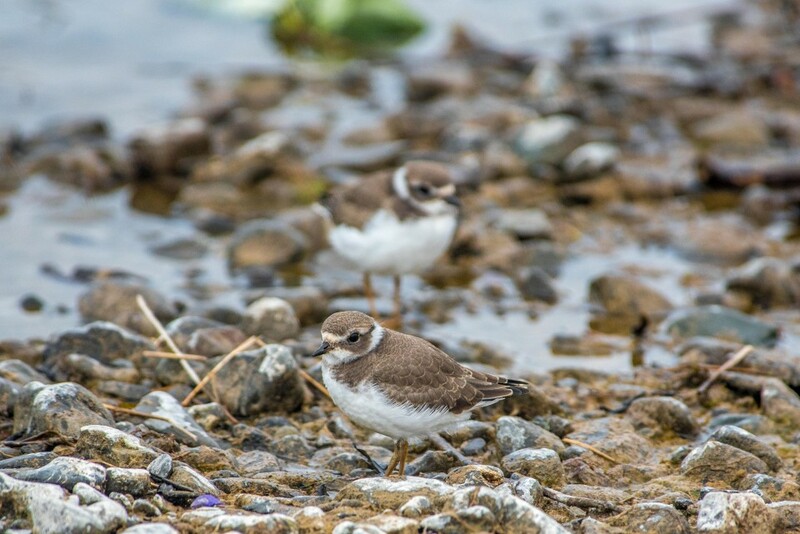 There was a family of Arctic Terns with nearly full-grown nestlings upstream and the clear 3-note call of the Golden Crowned Sparrow rang out across the tundra landscape. A rising barometer and fair skies” greeted us in the morning. From my tent as I dressed I heard Mew Gulls crying plaintively, a Bald Eagle “Chortling”, and hundreds of Salmon splashing. The early anglers began fishing while the rest of us enjoyed coffee. 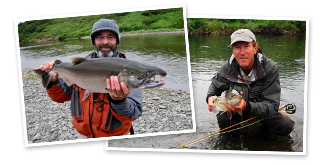 I fished and rafted with Jim Givens and we took Dolly Varden steadily and enough Rainbow trout and Arctic Grayling to keep it interesting. From time to time we looked at Brian’s lead boat with Father son team Dave and Danny and it was gratifying to see them both hooked up sharing the adventure. After lunch we passed down through the canyon of the Goodnews watching the bluffs and mountains above us, with little waterfalls and moss gardens. Jim saw a small falcon, either a Kestrel or Merlin. In the canyon Brian called to us that they’d spotted a Brown Bear on a ridge above the river on the right. We pulled up next to them and for the next 20 minutes the rafts got to safely watch a large, very blond colored sow with her quite large 3-4 year old cub graze on grasses and blueberries. We passed Binoculars back and forth. 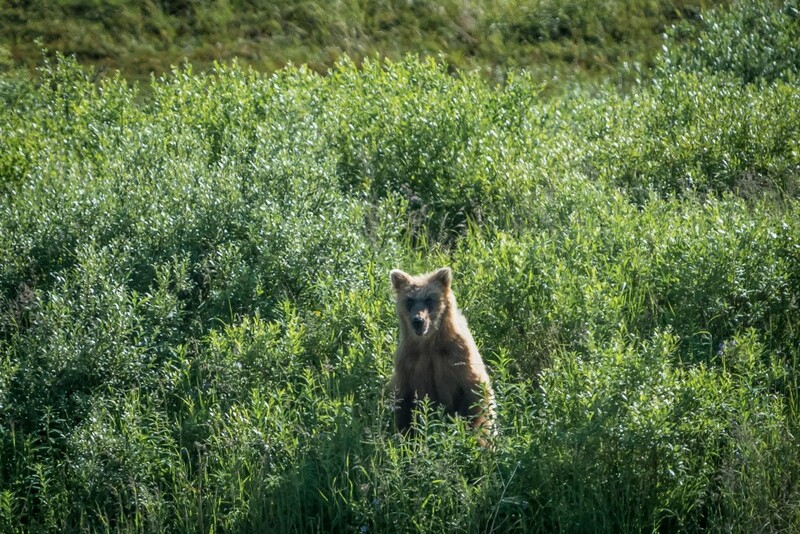 The cub was the largest that I can recall seeing in many years and it makes one think that the conditions in this particular, very remote canyon might be optimal for rearing cubs. 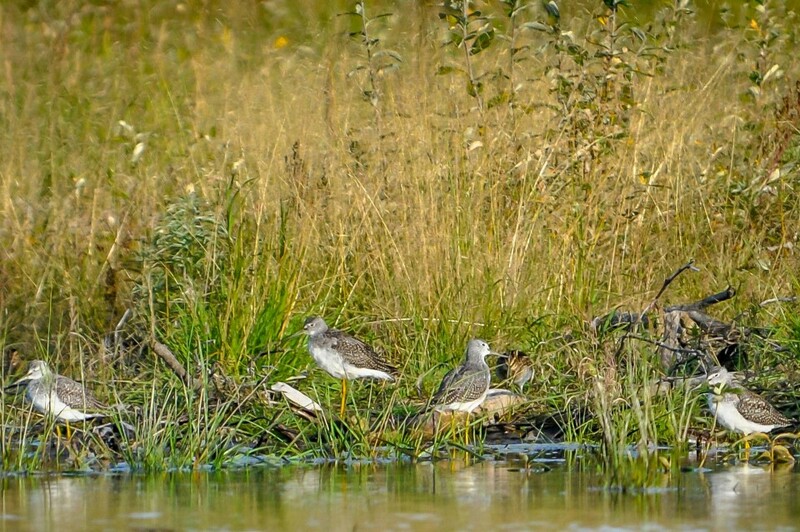 On gravel bars the naive young “hatch year” Yellowlegs and Spotted sandpipers were grouped in small flocks, unafraid. 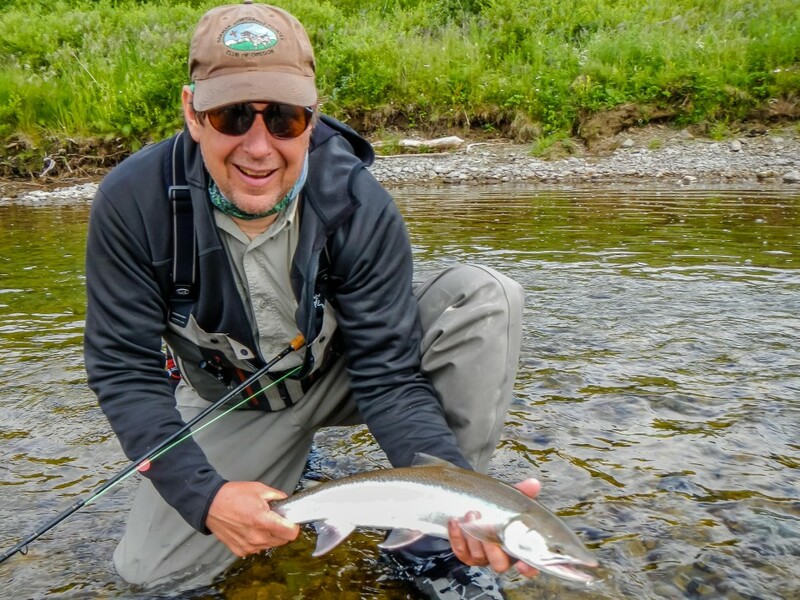 Jim took a very Large Sea Run Dolly Varden Char with a pronounced kype of the pre-spawn male. Pink Salmon were unaccountably numerous and the Kings and Sockeye were staged by the hundreds at the bases of bluffs. Mary, fishing with Nora dramatically hooked a King and released it and Will took a fine Sockeye! The young anglers Dan, Quinn, and Will did well. Summer is at its peak. “The weather is fair, without insects. Although rain showers threatened late in the evening there would be swimming in camp tonight!” But before we even shoved off “Will took an amazing trophy class male Dolly Varden Char. This day each boat took Char, Rainbows, and a few Salmon but the fishing was never easy. It was the classic fishing pattern where the morning fished well until the sun was high and bright and then the fishing tapered off. The fish have had 2 days of strong direct sun overhead in gin clear water and they became very tough to entice after noon. Still Mary and Dave, fishing in different boats both released Kings, and Jim Givens took two nice Sockeye but none of these fish were easy. Will had a really strong day with Dolly Varden, but then he was very very focused, perhaps “obsessed” was the modality and he fished all afternoon with an intensity that only Nora could match. In camp we traded fish stories and wildlife sightings and when I asked if any mammals had been sighted today Will had the only sighting “1 Red Backed Vole” near camp. 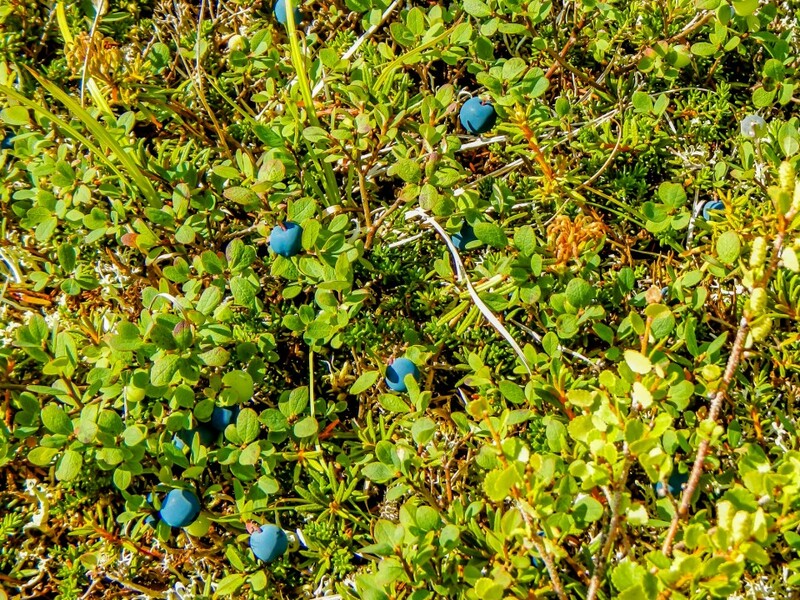 The wildlife of the Bristol and Kuskokwim Bay regions are not all mega fauna like Bears and Bald Eagles but in fact the majority is smaller, much smaller. It is the small mammals like Voles and Lemmings that power the mammalian food chain, feeding Weasels, Mink and Fox and it is the shorebirds and migratory song birds which nest here by the ten’s of thousands that are the most numerous wildlife of all! Today some adult Greater Yellowlegs (large Sand Pipers) were defending nesting territories with their irritating “car alarm” cry which is so shrill that one is motivated to move away from it as fast as possible. 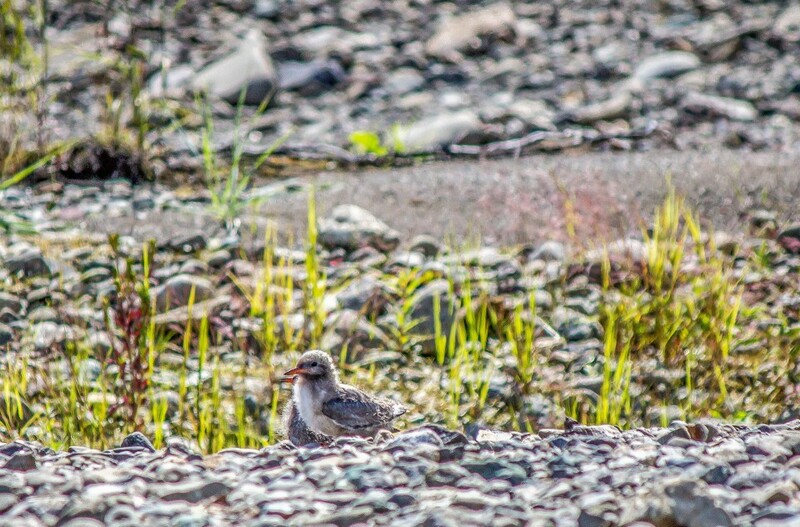 Arctic Tern Chicks stood silent completely still amid the pebbles and were functionally invisible as they waited for a parental food delivery of regurgitated salmon fry. Great Horned Owls were seen in their traditional nest site near the Canyon Creek Bluff. 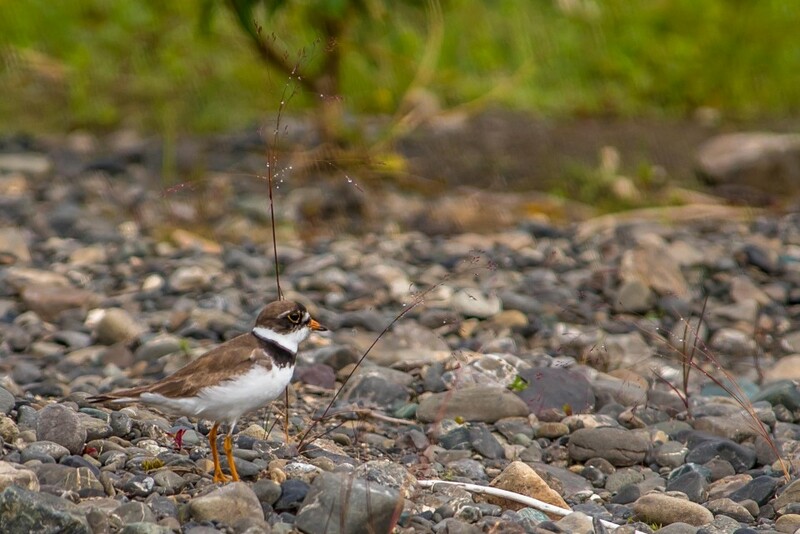 There they must have a good variety of small mammals and shorebird nestlings for prey. We passed the confluence with Canyon Creek and stopped to fish. Will and Danny both took really nice Rainbows from this, my personal favorite tributary of the Goodnews. Dan & I looked in awe at a set of very, very fresh adult Wolf tracks, thinking about the pack whose home range we passed through. I estimated that we have passed 2000 King Salmon and 20,000 Sockeye salmon in three days/ 30 miles. Some of the Chum Salmon are now spawning, while most are staged awaiting sexual maturity. At the close of the day’s travel we sat on a gravel bar in a circle of chairs eating personal Pan Pizzas that Chef Jinishian turned out. At 3:55 am a single adult Wolf began howling. A chorus of long pure harmonic notes from the direction of the tracks that Dan and I had seen at Canyon Creek yesterday afternoon. It made for a rich dreamscape and by 5:15 the songbird chorus wound up into full swing. It was morning number 4 and the stage was set for a great day although if you were a sun worshipper, the morning weather would set you back. It was socked in with a “pea Soup Fog”, exactly what the fish gods wanted! The Rainbow, King, Sockeye, and Char fishing easily doubled in productivity over yesterdays “sunburned” conditions. Today was a day full of hook sets, team netting from the boats, slacking the line once the fish was in the net bag, to unhook the spinning Char and so forth. 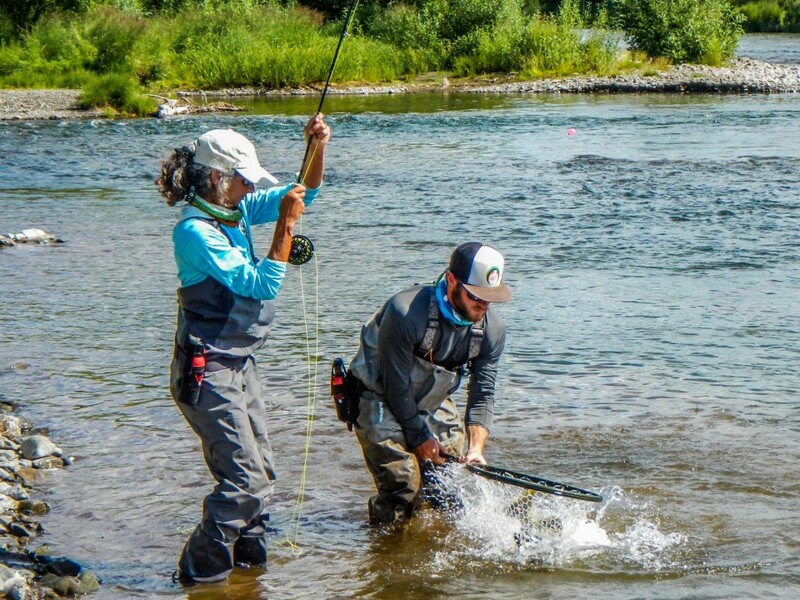 We changed tactics to dead drift nymphs for Sockeye, and took our time battling the heavy bodied Chum so as not to break fly rods. Nora and Dave fished the gravel bar beneath the Bald Eagle Nest. The adult was unperturbed. 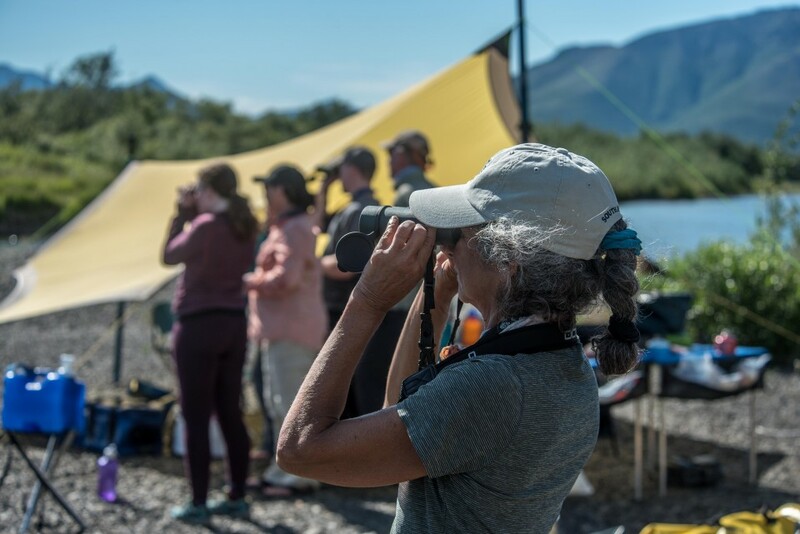 A Sandpiper on that Eagle bar tried to lure us away with a broken wing feinting act, Arctic terns swooped down and captured salmon fry in the slough, while the Eagle nestlings begged for food. It was a perfect morning. The sun emerged from the fog and the fishing fell off but we were satiated. 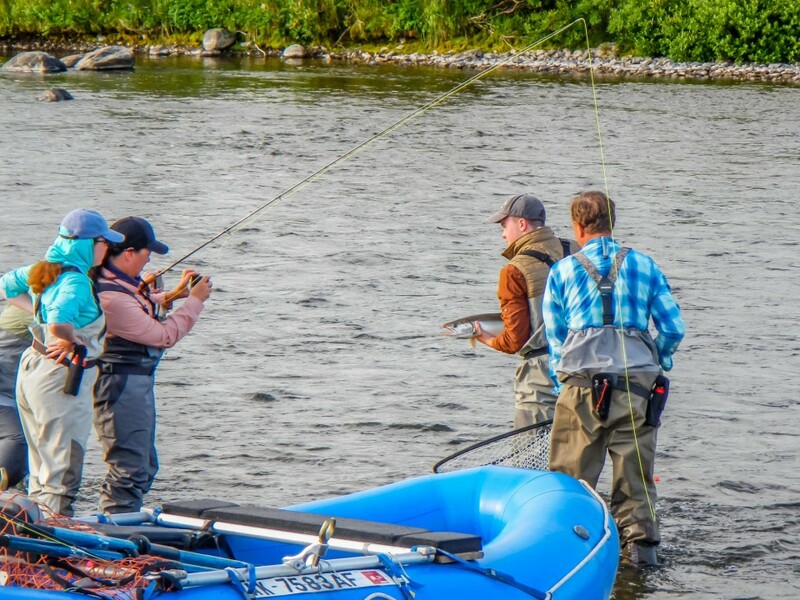 Anglers released Kings and Sockeye and then Will landed and carefully released the fish of the day, perhaps the fish of the trip: a #25 pound King. He followed that by killing tonight’s fresh Sockeye for dinner. His brother Dan released a nice Jack King and Mary released a chrome Pink Salmon. In a camp known as the “Wolf camp” from prior wolf sightings, we chilled out and had appetizers reliving the day’s fishing excitement. While we chatted we photographed a brown Bear on the adjacent hillside. 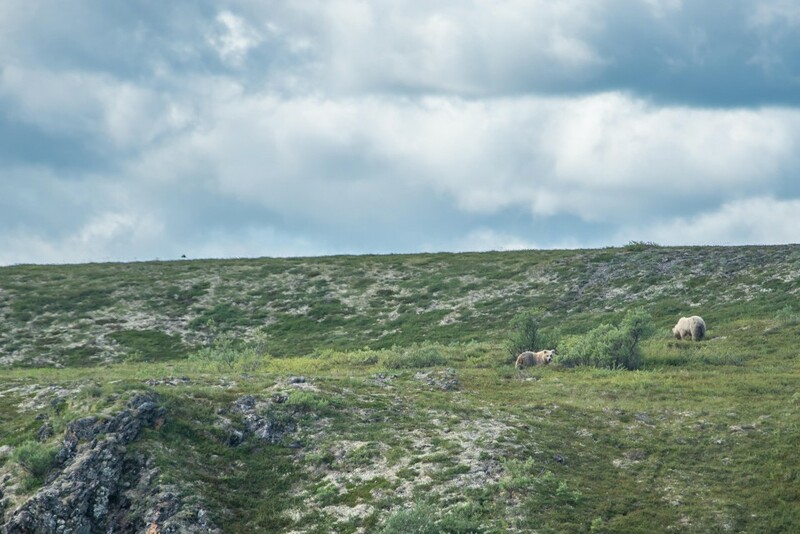 It would have been the perfect wildlife observation however a low flying helicopter scarred the bear and it ran, looking over its shoulder, panicked by the aircraft. Brian filleted Will’s salmon and we dined on fresh salmon with rice, & toasted slivered almonds and a salad then closed out the evening fishing from the point below camp watching the sunset. 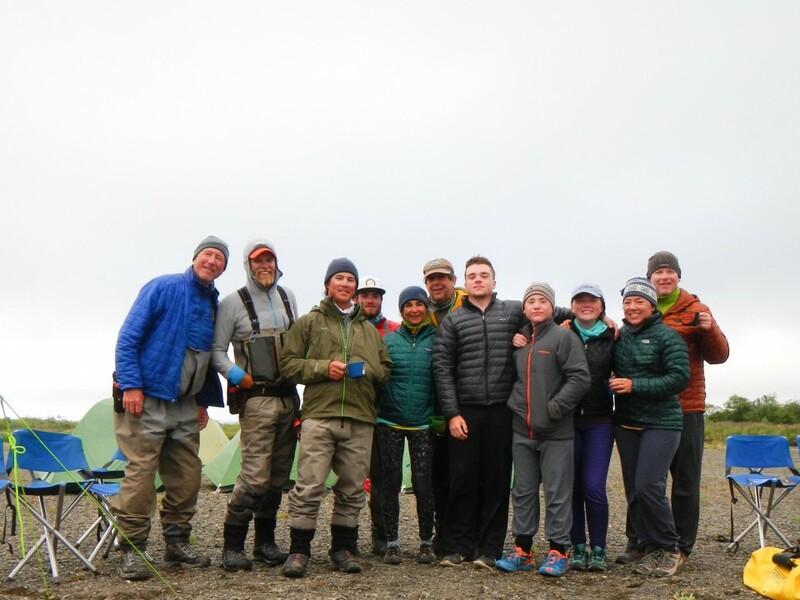 Again the weather was fair but cooler than previous days, as each mile brought us closer to the Bering Sea. Jim and Mary and I fished together and the Char fishing was steady. Small flocks of Least Sandpipers traded from slough to slough as we passed and small family groups of Sand hill Cranes fed on blueberries in the tundra then trading back and forth across the valley. Mid day the wind became stiff and we fought to get our casts delivered to the targets. Jim took a nice Jack King and Will also provided a Jack, which we’d later cut into small steaks for appetizers. 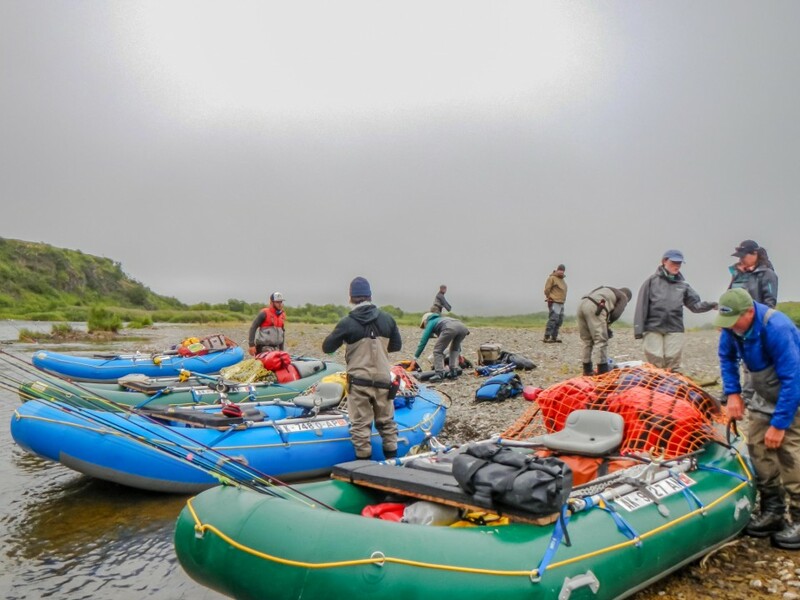 Then word passed among the rafts that Danny had taken a spectacular Sockeye for dinner! 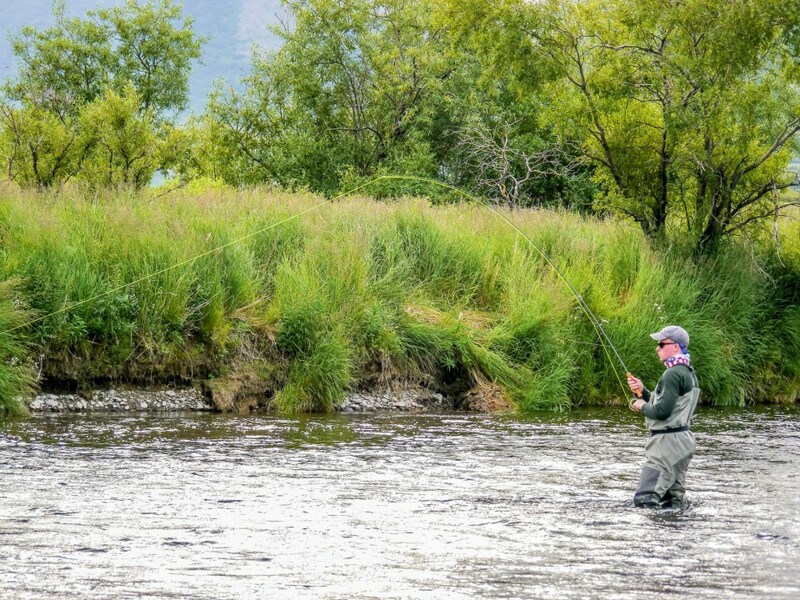 Catch and release fly-fishing is what we do for recreation, but there is considerable satisfaction when you are the angler who feeds the camp in the evening! 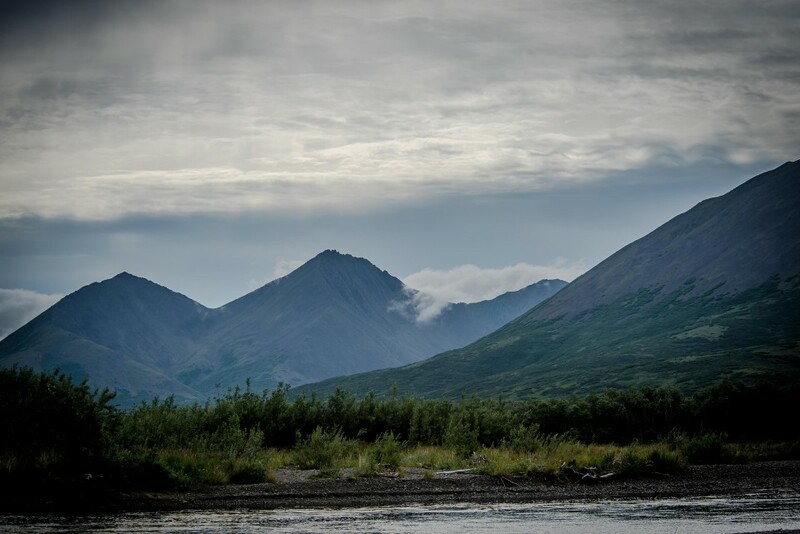 We fished through the wind as long into the afternoon as our casting shoulders allowed and then we put the rods down and pushed hard on the oars into the headwind toward camp. 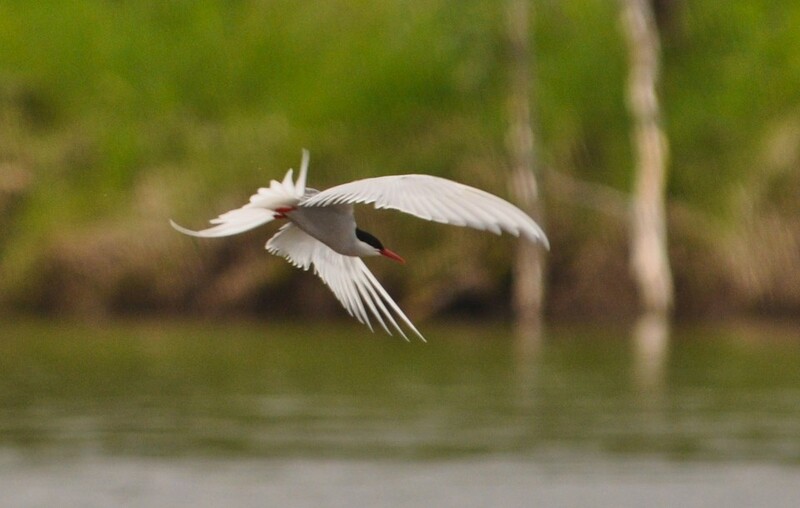 Brian, Will, and Quinn went ashore to scout for a camp and within seconds were attacked by Arctic Terns! A family of Terns with 2 chicks was vigorously defending the gravel bar and there is simply no use arguing with a Tern. The small seabird completely dominates the land and sky near its nesting island and won’t allow your presence. We chose another gravel bar and settled in for the evening leaving the Terns in peace. It rained overnight and off and on all day, misting mostly but occasionally showers that were heavy. So Nora and Quinn and I had our hoods up and in the intervals between hard rain we wiped our polarized glasses off and recast our fly.” They took a number of Dolly Varden below the Eagle perch on the cliff with orange lichen and Brian’s boat took that right channel to pass below the Eagle nest and was rewarded with a great wildlife sighting. 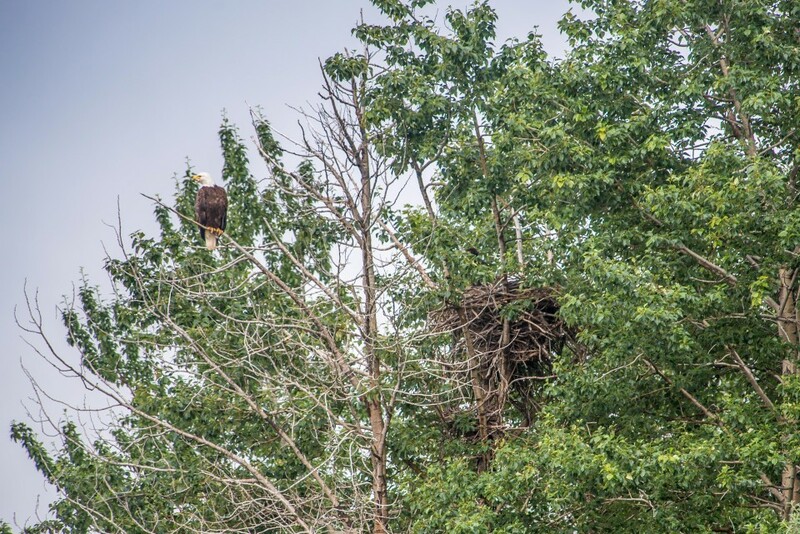 An adult Bald Eagle flew past with a Char in its talons and dropped it off for the nestlings. At lunch Nora killed a lovely Sockeye for tonight’s sushi. 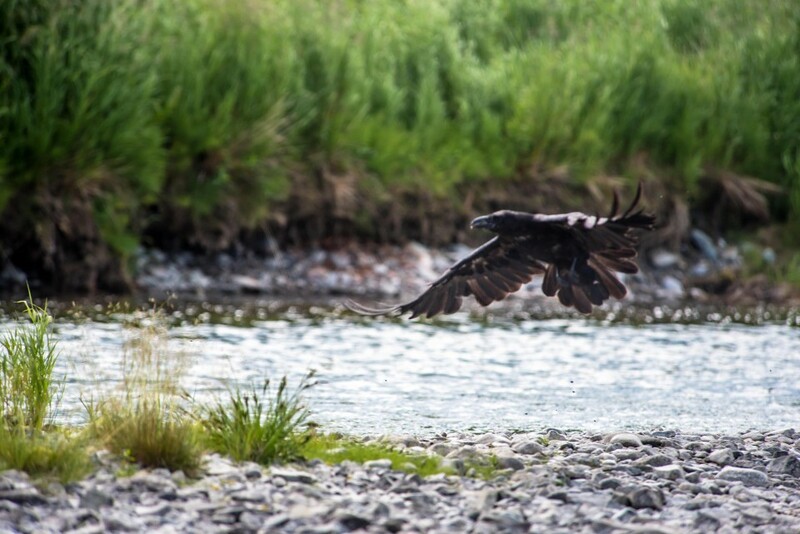 We rafted downriver listening to the muted croaks of a family of Ravens, whose young were just learning basic flight skills and weren’t completely up to the task of landing in a riverside willow tree. 2 finally managed to perch on a willow branch but were so close together that they bumped one another off which set off another round of raucous croaking. I fished and rafted with Quinn and in between fish we watched birds. Quinn is one of those rare anglers who can accurately tally the fish caught each day, (most anglers being known to exaggerate the numbers they catch). In any case she has kept a running tally and was 6 fish shy of a “Century” in other words in 6 days she’d logged 94 fish to the net.Those final six fish were not easy but she succeeded and in the process had some memorable moments fishing within a few feet of some adorable fledgling Semi-palmated Plovers. In our final camp the young naturalists found a Beaver skull and Femur and some Raven Primary wing feathers, which they investigated in detail. 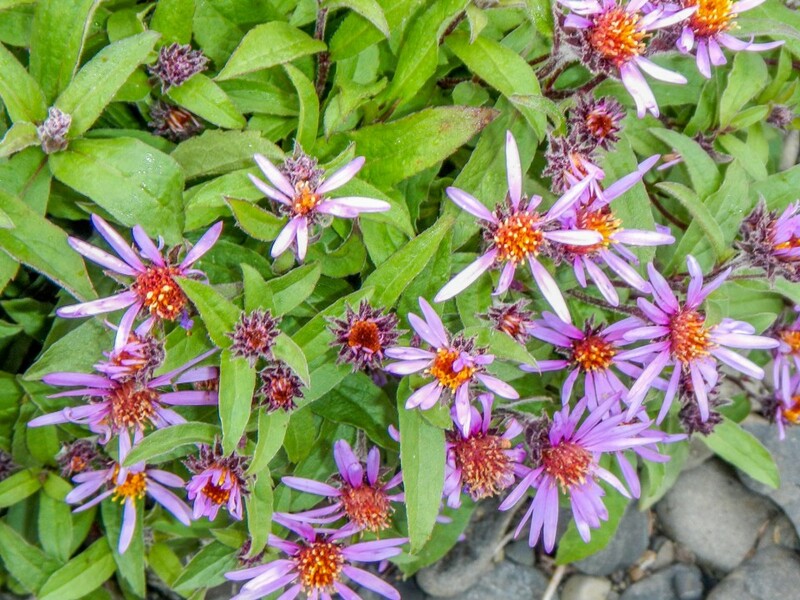 I was reminded that during this week we were transported away from our “known world” into a wild landscape, and we see the world differently, perhaps in greater detail. 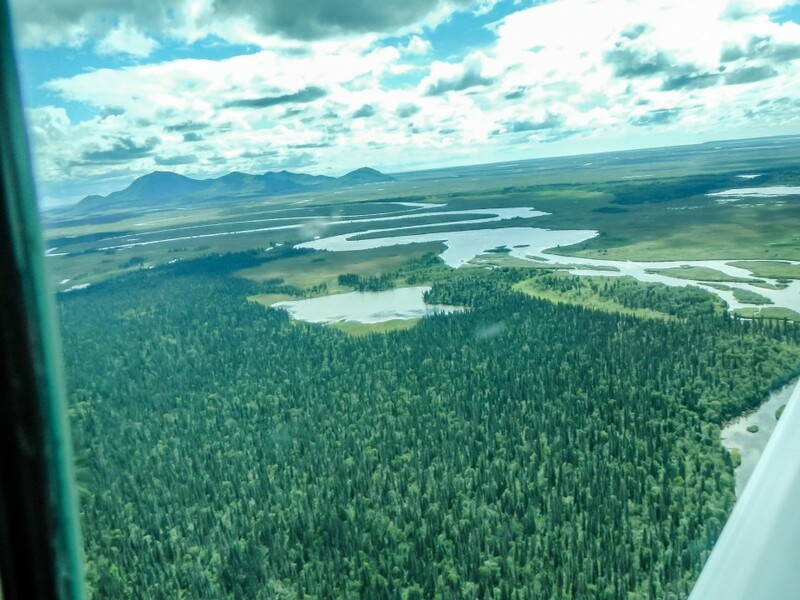 We’d experienced fish in their ten’s of thousands surging up-river, large bears grazing as they have since the last ice age, and the Sand-hill Cranes with their “yodeling” call unchanged for a hundred thousand years. These experiences likely transport us individually into a special part of our being where we can re-charge our batteries and experience at a granular level the incredible world that we share with these other animals. 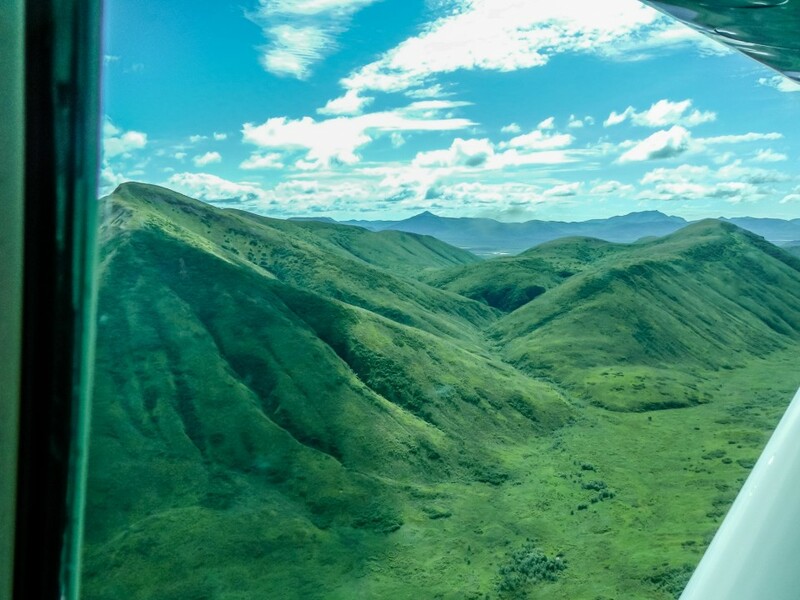 We departed the treeless tundra and flew south back into the tree line and landed in Dillingham. Trees! Automobiles! Hot showers!